Coping stones add a finishing touch to any walling project. That’s why having a variety of options when looking to buy coping stones online is crucial. The aesthetics of coping stones (used to finish the walls themselves) and pier caps (the stones which are used to cap piers or gate posts/pillars) are as important as how durable and weatherproof the products are. Do I need once weathered, twice weathered or flat concrete coping stones? 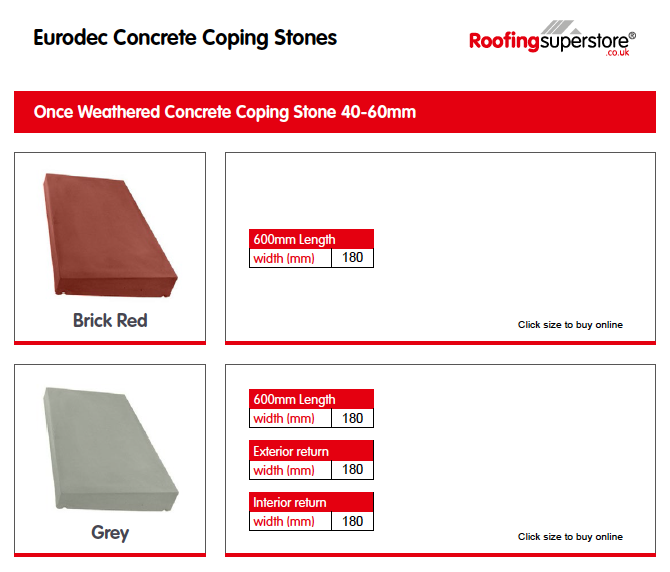 Which colour coping stone do I want to buy? What length does the stone need to be? Finally, what is the width of the stone? Once you answer all of the above information, you will then be in a position to go ahead and order your coping stones online. Don’t forget, our team of friendly advisers is also available from Monday to Friday, 9am to 5pm if you need assistance with your purchase. Just call us on 01752 692 760 for assistance. Alternatively, use the live chat function in the bottom right-hand corner of our website. 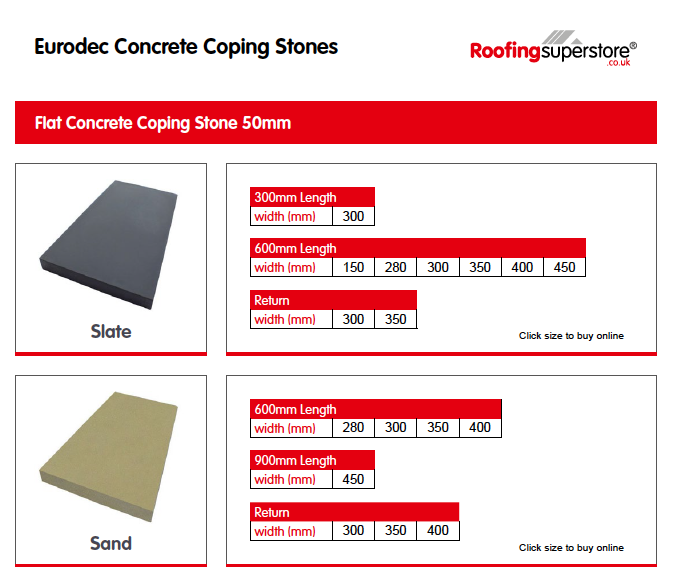 Eurodec manufactures our best-selling range of coping stones. British-made, Eurodec’s trusted brand name and high-quality products appeal to both our DIY and trade customers alike. Once weathered, twice weathered and flat stones are available. They come in a choice of four colour options and a wide range of sizes to suit your project. 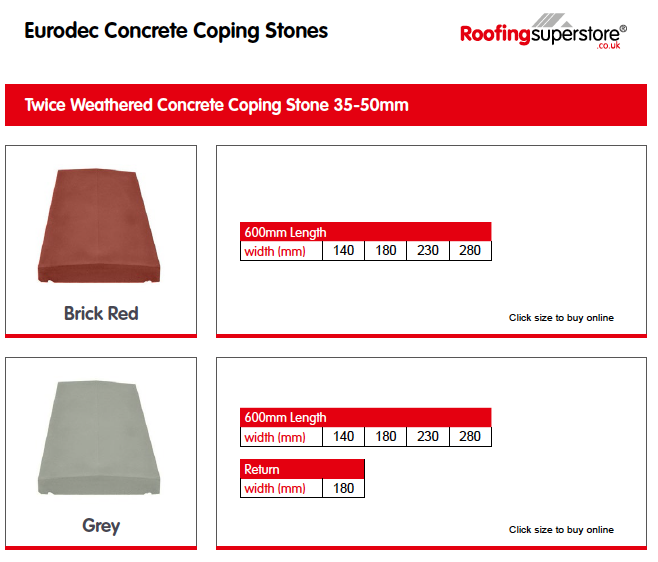 To help you navigate our range of over 400 coping stones by type, product size and colour, we’ve pulled together the technical guides below so that you can quickly find exactly what you need. 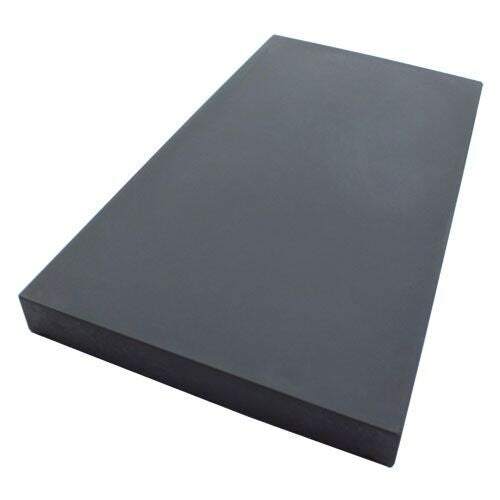 Follow the above list to look up the correct product and click on the size in the document to be taken straight to the correct coping stone on our online store. If you require more information or assistance, call our friendly advisers on 01752 692 760. Alternatively, email sales@roofingsuperstore.co.uk or use the live chat function in the bottom right-hand corner of our website.